Getting your business website found on the internet these days is vital. A key way to achieve successful search engine optimisation (SEO) and push your site towards to the first page of Google, is to get your site to produce friendly URL's. These are web addresses that have real words in them, like across our own pages and we do it, as a matter of good practice, with all our clients web sites. 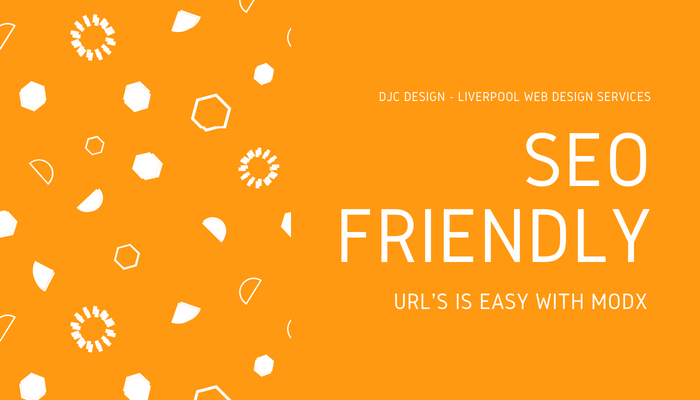 Many web sites and content management systems (CMS) produce something meaningless like - https://www.djcdesign.co.uk/index.php?id=11 , which is of little use to real people, or the 'spiders' that the engines send across the internet checking pages.. The preferred content management system that we use for large sites; Modx , creates quick and easy SEO friendly URLs. It can harness the power of web servers to allow more meaningful names to be used. We create sites that clients themselves, can decide what URL they would like and enter this into to a field in the administration area of the site. All very simple! So if you are looking for a content management system solution with excellent SEO credentials, choose Modx and DJC Design to help you get the high page rankings on Google your business deserves. Give David a call or drop us an email for more information. We also develop brochure style sites using Wordpress. Again don't hesitate to get in touch.